A short drive north-east from Nelson is a green valley that leads between forested hills to the sheltered, shallow waters of Rotokura/Cable Bay. It was named for the cable connection made in 1876, linking New Zealand through Sydney to the rest of the world. Later, the telegraph cable was moved to Wellington – but the valley still features a cable and it’s a lot of fun. At 1.5km, Cable Bay Adventure Park’s Skywire Experience is the longest flying fox in the world. Even better, four people can do it at a time, strapped into seats zooming along at up to 100 km/h, 100m above the bush below, forwards and then, even more fun, backwards. Part of the ride is slow, too, so you can hear the birdsong and enjoy the long views. At 1.5km, Cable Bay Adventure Park’s Skywire Experience is the longest flying fox in the world. The Argo is an eight-wheeled, all-terrain vehicle that your driver will make as wet and splashy and bumpy as you want. Because no way is that all. There’s something here for everyone. 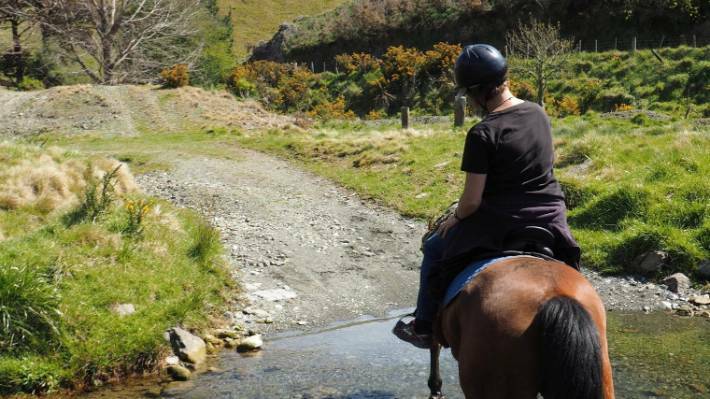 You can go for a gentle ride on a well-mannered horse, while more active types can tackle obstacle courses and then splash across a river and into the bush to wind up to the top. Have a cup of tea there and a biscuit, feed the weka and, if you’re lucky, you might be able to see as far as Mt Taranaki. Or how about doing a quad bike tour? You can ride solo or take a passenger, along forest trails, across farmland, up and down hills. Too tame? 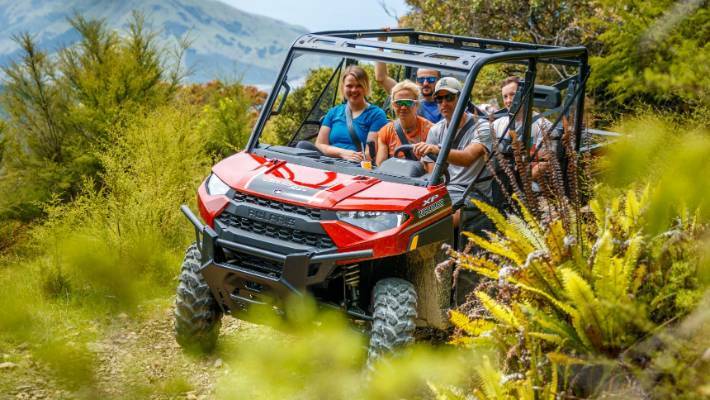 Then go for a ride in the Argo, an eight-wheeled all-terrain vehicle that your driver will make as wet and splashy and bumpy as you want (or as sedate). There’s a big paintball theme park too, with forts, trenches, creeks and everything else you need for a messy battle. There’s also an archery park here: learn how to fire a bow like Legolas. There are mountain bike tracks (shuttle to the top) and e-bikes to hire for a gentler pedal around the park. Kids will enjoy the toys, messing about in the river, or feeding the farm animals and eels. And everyone will appreciate the licensed café: wood-fired pizzas a Friday and Saturday speciality. 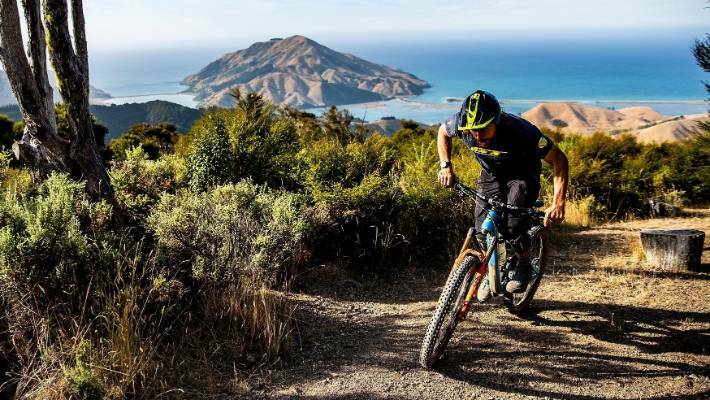 Cable Bay Adventure Park’s mountain bike tracks offer great views of the incredible landscape. 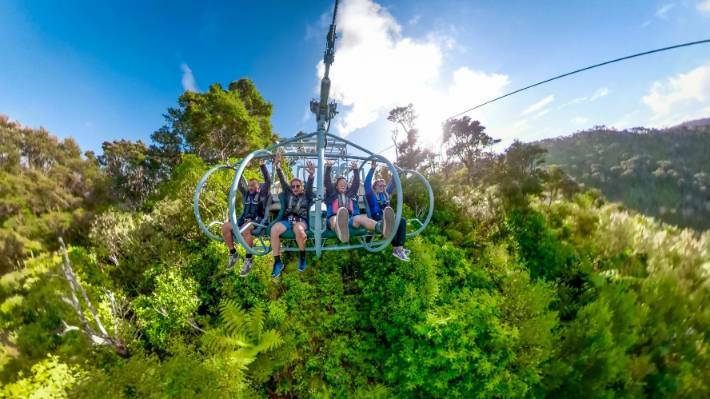 If it’s the Skywire and horse trek that rock your boat, they’re available as a combo: ride up to the flying fox, go for a whirl and then continue your ride. Carry on down Cable Bay Road and you’ll get to the causeway across to Pepin Island. You can swim and go kayaking here, or maybe do the Cable Bay Walkway: about three hours along the coast one-way to Glenduan, with impressive views en-route. Well-mannered horse offer gentle rides around Cable Bay Adventure Park. Prices start at $25 for two hours of Paintball, up to $230 for the Skywire/horse trek combo. The Skywire alone is $95 adult, $65 child, $270 for a family of four. Open daily.